For my second graphics assignment I had to make use of procedural generation techniques to create a scene. 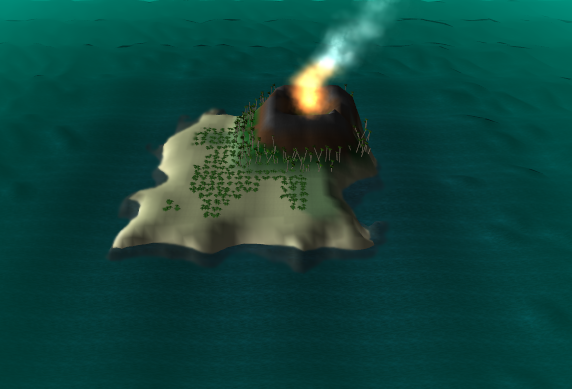 I decided that it would base mine around a volcanic Island , complete with water simulation and a particle generator. The generator I created can produced some quite nice scenes. It could probably be useful in creating a Caribbean type environment populated with islands. The smoke particles that are generated also get effected by the environment wind and the height of that particle. This provides a nice scattering effect for the smoke as it rises. This entry was posted in OpenGL and tagged code, foilage, island, ocean, OpenGL, particle generator, Procedural Generation, Projects, prototype, shrub, system, tech, tree, university, volcano, wind on 11/11/2012 by Stewart.